LIKE lots of girls, Cara Nicoletti played Little House in the Big Woods in her childhood. Unlike her friends, however, she was the only one who didn’t think it was a big deal to hoist a slaughtered pig over her shoulder when it was her turn to play Pa Wilder. A bookworm who spent afternoons in her grandpa’s Boston butcher shop, Nicoletti was as comfortable darting between beef carcasses as she was sitting on a milk crate reading Nancy Drew, so it’s no surprise that she formed an inextricable connection between victuals and fiction. “My dad was an English teacher and my mom taught preschool, so books were really important in our house,” says the Brooklyn-based foodie. The 29 year-old chef and writer has spent the last several years developing her literary palate into actual recipes. Her blog, Yummy Books, is stocked with tested how-to’s of some of literature’s most famous meals—from Great Expectations’ pork pie to the Boxcar Children’s from-scratch chocolate pudding to Hannibal Lecter’s fava beans—and now she’s turned the project into a book of her own. Voracious: A Hungry Reader Cooks Her Way through Great Books comes out this month, and bookish gourmets will have a chance to sample some of Nicoletti’s dishes when she appears at Smith Brothers Butcher Shop on Thursday, Oct. 8. Presented by the Savannah Book Festival, the free event feature nibbles cooked up by the Smith Brothers’ team as Nicoletti signs copies of Voracious. Each recipe from the book will be paired with wine, and we can only hope that the aforementioned Silence of the Lambs’ Crostini with Fava Bean and Chicken Liver Mousses will be accompanied by a nice Chianti. Smith Brothers and its glorious glass coolers of steaks and charcuterie couldn’t be a more apropos locale for Nicoletti, who became a butcher herself in 2010 after years as a restaurant pastry chef. 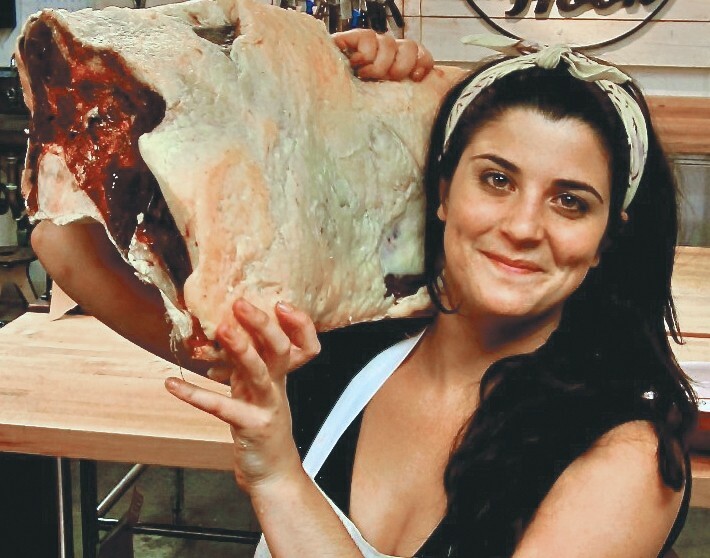 She still sharpened her knives and made it through an apprenticeship at the Meat Hook, a boutique butcher shop in Brooklyn that deals in sustainably-raised meats. Her mentors hired her on, so she dropped pastries for pork loin and hasn’t looked back. Baking up a blackberry tart may seem easier—and a lot less bloody—than breaking down a whole cow, but Nicoletti says they’re not so different. Voracious contains plenty of meatless dishes, like Crab Stuffed Avocados courtesy of The Bell Jar and White Garlic Soup from Pride and Prejudice. Nicoletti also shares her sweet side in Mrs. Dalloway’s chocolate éclairs and Gone Girl’s brown butter crêpes, plus a recipe for jelly donuts that will make everyone agree that A Confederacy of Dunces should be required reading. The literate butcher admits her reading tastes are as eclectic as her palate, mixing up childhood classics and leg of lamb with pop fiction and sugary confections. While Nicoletti wields knife and keyboard with equal deft, there’s one book that’s still eluded her decocted musings: Virginia Woolf’s A Room of One’s Own.